Due to having frequent ear infections as a kid, I had to be careful to not get any water in my ears. This is something I still carry with me today. I never dunk my head underwater in a pool and always cover my ears when I wash my hair. I don’t ever remember using conventional ear plugs in the pool, but I remember all too often having my mom jam Silly Putty into my ear holes. I was thinking about this the other day, and how I was the only kid to have Silly Putty stuck in my ear at every pool party. Was this actually a thing or was my mom crazy? 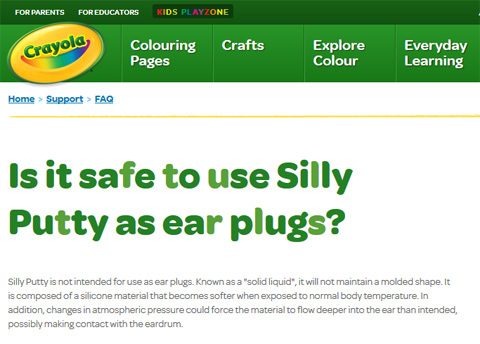 According to the Crayola site, the makers of Silly Putty, using the stuff as ear plugs is a no-go. The fact that this is on their website means I wasn’t the only kid out there with a misguided but well-meaning mom. On the packaging itself, Silly Putty says it’s “not intended for use as ear plugs”. That didn’t stop my mom from stocking the medicine cabinet full of Silly Putty for ear plug purposes. I mean, stores sell ear plugs. They’re probably right with the rest of the swimming safety stuff. Yet my mom figured the tight seal of Silly Putty would protect my ears better than anything specifically designed to keep water out of ears. If being the super pale kid wearing a T-Shirt at the pool didn’t single me out enough, the Silly Putty sure didn’t help. When you think of Silly Putty, you picture a red egg with that weird beige goop inside. Alas, it was the 90s. I had hot pink Silly Putty most of the time. There was no cool way to hide it. It did match the pink and blue Zinc Stick line down my nose, at least? I also had long hair as a kid and would always manage to get Silly Putty matted in the hair over my ear. After I’d come inside from swimming, I’d spend 20 minutes in the bathroom just picking the gunk out of my hair… and mostly growing frustrated and ripping hair out. Photo Courtesy JAMA Otolaryngology – Head & Neck Surgery. One of the most common diseases of childhood is otitis media that historically accounts for a large percentage of health care in the first 5 years of life. Ventilation tubes are a common way to manage recurrent acute otitis media and chronic middle ear effusions. Protection from water exposure is an important issue as it may contribute to infection. 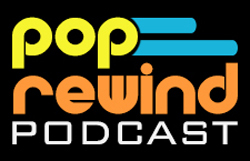 We would like to share an unfortunate case involving Silly Putty used as an ear plug. Many physicians and the lay press suggest that this material is a good option for prevention of water exposure as it is easily moldable and readily available. This child underwent an examination under anesthesia for an external canal filled with Silly Putty. Removal was made difficult because this material softens at body temperature. Silly Putty had gone through the tube site perforation into the middle ear. Some had become incorporated in the fibrous layer of the tympanic membrane. Removal required a posterior tympanomeatal flap for ear exploration and resection of a portion of the tympanic membrane. The long-term effect of such a substance to the middle ear and tympanic membrane is unknown. 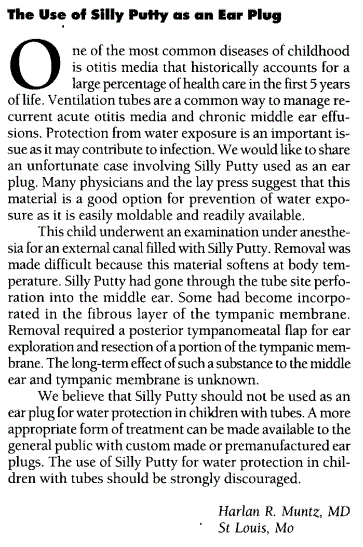 We believe that Silly Putty should not be used as an ear plug for water protection in children with tubes. A more appropriate form of treatment can be made available to the general public with custom made or premanufactured ear plugs. The use of Silly Putty for water protection in children with tubes should be strongly discouraged. (Harlan R. Muntz, MD, St Louis MO. Arch Otolaryngol Head Neck Surgery, Vol. 121, March 1995). I don’t know what that all meant, but the parts I did pick up on were horrific. To think, the only drawback I saw back then was getting some hair stuck in my ear plugs. Now I know my mom was trying to kill me. Were you one of those weird kids at the pool with Silly Putty in your ears?